Every body is unique and that is why our classes are not group led. At Boditree Pilates each client, whether in a group or private setting, does their own set of exercises carefully selected to support their own body and goals. 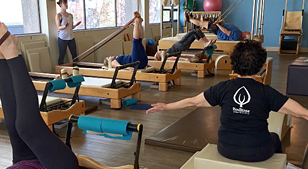 Any body at any age can benefit from Pilates — whether your goal is to recover from an injury, to manage chronic pain, to challenge your strength and coordination, or to simply look and feel your best ever, we can create the program to get you there. Your needs will change over time as you progress through Pilates to meet your goals. Boditree Pilates and Healing Instructors constantly keep an eye on you as you work out, offering assistance and advice, so you can be sure to get the most out of your workout. As you improve and your body is ready for new challenges, your instructors will be able to take you to higher levels by expanding your repertoire and setting new goals.